Our moon is full this year on December 17th 2013 . Full moon times are given below. The Native American tribes are where many of our names for moon months originate. The Native Americans reckoned time by the different months of the year and thus the New and Full Moons were of upmost importance to them. Their new year began in March and was divided into thirteen moons. At each new moon a big feast was held which was named often for the fruits in season or the game that was hunted for their food at this time. The beginning of the year in March was noted with a huge feast called the Moon Festival, or Deer Festival. Each moon month brought with it it’s own particular characteristics and it’s own opportunities for spiritual growth. You can use each particular moon month in the same way. Think about what the December moon means to you and what your hopes and dreams are for this month. For me the December Moon would be called ‘Family Moon’ As a Pagan family we celebrate both Yule and also Christmas as a time to be with family. I love the fact that for those times you can just have quality time with your family with no outside distractions. 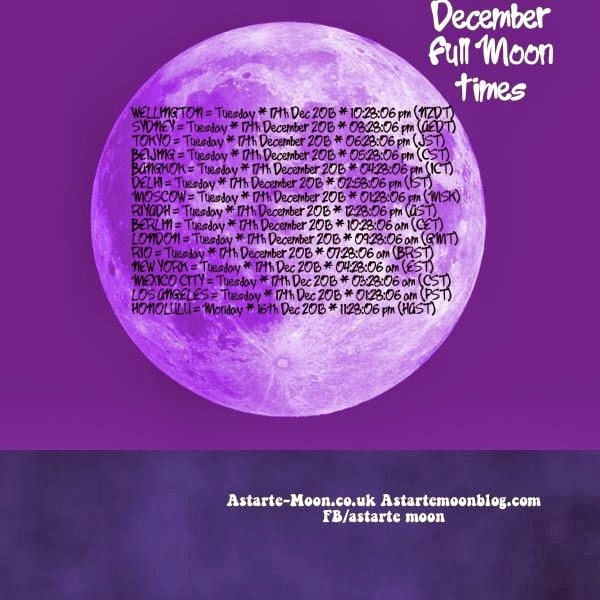 A lot of the moon names in December centre around the weather as you would expect! December is the month where it did really turn cold in many areas around our earth and so the names such as Snow Moon, Cold Moon and Bitter Moon arose. In Cherokee tradition, Vsgiyi, the spirit being or “Snow Man”, brings cold and snow to our earth. The earth rests until the rebirth of the seasons in the Windy Moon in March. Although here in England at the moment it is still incredibly mild, I have hardly had my heating on which is great for my fuel bills! The December moon is also commonly known as the long nights moon as this is the closest moon to our Winter Solstice or Yule when we will have the longest night and the shortest day. The moon will be above the horizon for the longest amount of time she has a high trajectory across the sky because she is opposite a low Sun. This month of December therefore gives us lots of opportunities for observing her beauty! 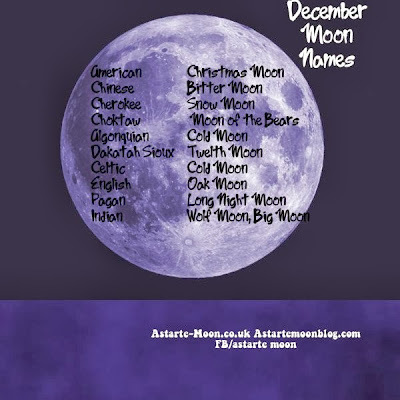 I found an alternative for the Choktaw December Moon being Peach Moon. I can't find any information as to why it would be called Peach Moon in the middle of winter! Does anybody have any ideas?! Across many traditions December has always been an important month. We see of course the Solstice or Yule on the 21st originating from ancient Celtic origins. Then we have Christmas on the 25th, the day given to the birth of Christ in Christian tradition. It was the tenth month on the old Roman calendar and the time of Saturnalia involving much feasting. The old Norman word is Heilagmanoth, or Holy Month is so called because of its large number of sacred festivals. This moon was called Heilagmonth Moon for this reason. In Jewish tradition December is the time for the festival of lights. On the old Tibetan calendar, December 1 was the beginning of a new year, so this was the first Full Moon of their year. In Mexico, the ancient Mayan goddess Ixchel is still honored in southern Mexico today with processions and rituals that bless boats and fields. In Japan, it was the time when the hiding Sun goddess Amaterasu came out of her cave. As well as looking at the different moon names for the month of December and finding the one which resonates most with you, it is also useful to look at the characteristics of the moon in the month in which you were born. If you were born during the month of the December Moon you often have a colder exterior but with a glowing warm heart beneath. Given the opportunity this warm inner strength will radiate outwards and affect all those that come into contact with you. You have faced adversity and may continue to do so but your warm inner strength gives you the power to work through whatever life throws at you. In honour of the importance of this December Moon to so many cultures around the world I have found a chant you might like to use on the night of the full moon. Enjoy the wonderful glory of the full moon in December as she graces our skies from sunset to sunrise. Our moon will never be in the sky as long as she is in December so make the most of her healing light! 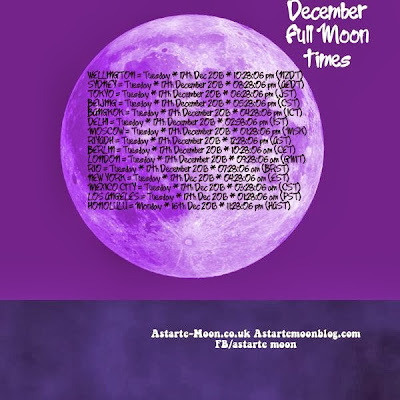 Decide which qualities of the December Moon you would like to include in any rituals you carry out this month. I will be performing a ritual to strengthen family bonds and security.